Contains special compounds that eliminate chlorine and chloramine, and bind up heavy metals. 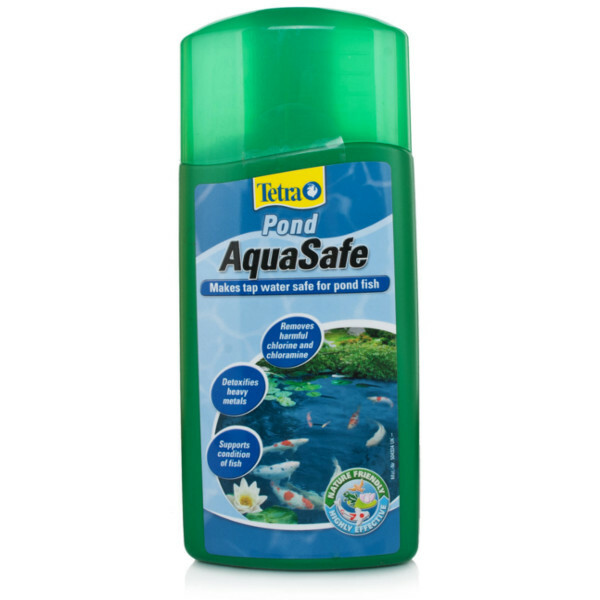 Tetra Pond Aquasafe makes tap water safe for fish by removing harmful compounds and adding beneficial substances. Tap water contains chlorine and chloramine, and while it is safe for humans, these chemicals can be very harmful for pond fish. Removing this chemicals is vital in any Pond water. By using Tetra Pond AquaSafe when filling a new pond or when performing a water change, the treatment works to break down and remove the harmful chemicals and make the water safe for the fish and will leave no residue in the pond. Add 50ml of Tetra Pond AquaSafe to every 1000 litres (220 gallons) of water, to remove heavy metals and chlorine. Either treat mains water prior to using it in the pond, or treat the whole pond with AquaSafe prior to topping it up with mains water. For improving fish health and aiding wound recovery, add AquaSafe at 25ml per 1000 litres (220 gallons) every 2-3 weeks.